You do not need to login to place an order. But if you do register, you will be able to see your order history. 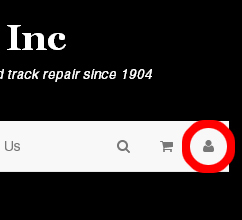 To register (and to login after you have registered) click the icon on the far right of the white band on the top of every page. If you currently have a passcode used on the old Aldon site, enter that in the box on the registration form. Many Aldon products are made-to-order based on the size of your rail or your dock area. You will find a sizing form on those product pages. It is important to accurately complete this form for your derail, or rerailer, or box car door opener to work properly. Please note that your shopping cart order will not display freight charges. Freight charges will be calculated at the time your order ships. Unless you provide a specific freight service on the checkout form, we will determine the most economical and efficient shipping method.